There is no doubt that Google is the most popular and best search engine to search, find online contents using key search terms. But What about the local file contents ? Just think about the situation that you forget the name of the document, but know the content of it. There is not great program to find the files based on the contents of specific files. Yeah, Previously I’ve shared the best free Windows search software to find the files at the lightning speed. And also to find the huge files that eating up hard drive space. Now I’m going to share DocFetcher which is the windows search application that returns the document files based on the contents of it using the keywords. 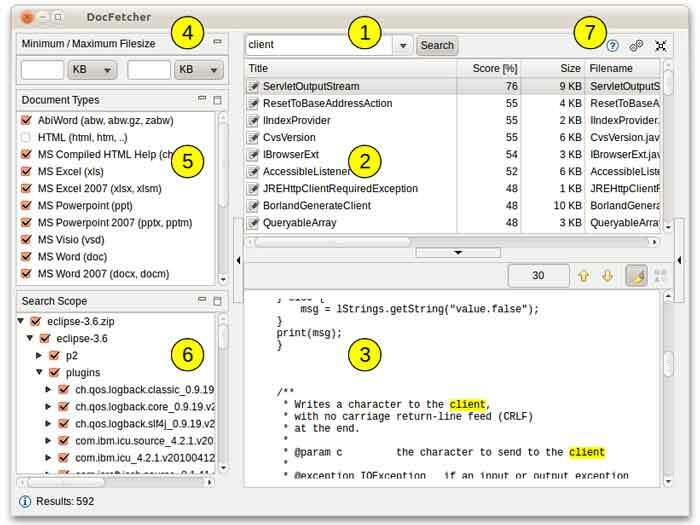 DocFetcher is an Open Source search application which is released under the Eclipse Public License. It allows you to search the contents of files on your computer based on the keyword. This application supports Windows, Mac and Linux Platforms. Especially this program is most useful when you don’t remember the file name, but you know the contents of that particular document. Just enter the queries in search box and get the search results in blazing fast about milliseconds. For that you have to index your document folders before once. Indexing your files in Docfetecher will return your search results very quick and speeding up the search. 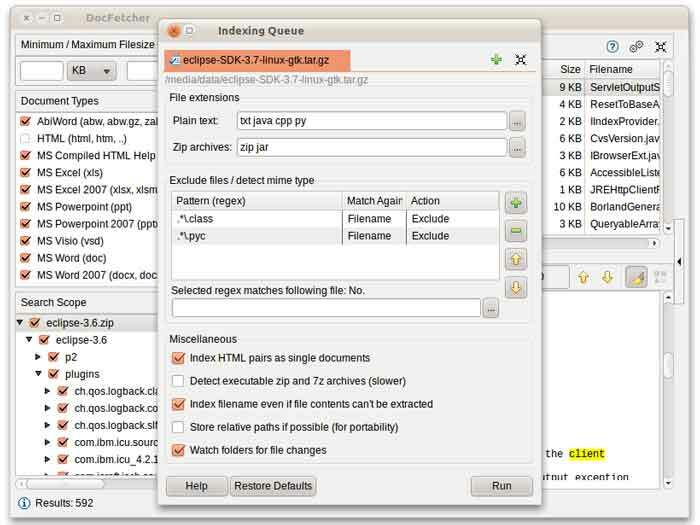 Download this DocFetcher and open the Indexing Queue dialog box and add your Document folder for Indexing. Then click the Run Button to start Indexing your files. The indexing process can take a while, depending on the number and sizes of the files to be indexed. A good rule of thumb is 200 files per minute. If you have changed the contents in the previously Indexed folder, then repeat the above process, this time just a few seconds your index will be updated(Much faster than the creation). Just enter the search keyword in the search box, the search results will be displayed in the results pane. Also, You can get the preview of the file contents in the preview pane. In addition, DocFetcher offer file filters, that is you can search your files by file type and by location. It gives you the ability to search the files in Archives like Zip, Rar, 7z ans Tar family. DocFetcher allows searching for Outlook emails, which Microsoft Outlook typically stores in PST files. Windows Explorer right-click integration, special support for HTML files, automatic index updates and more.